As Commissioner of the USA Pavilion, I am pleased to announce the participation of the United States at Astana Expo 2017. 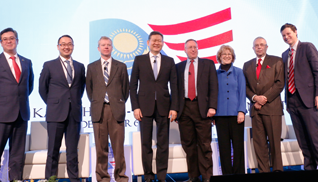 Expo 2017 “Future Energy” will be the largest and most prominent event hosted in Central Asia so far in the 21st century, and the USA Pavilion will showcase American ideals and innovation in energy to millions of visitors from Kazakhstan and around the world during the three-month Exposition. Through exciting stories, stunning audiovisuals, and hands-on interactive experiences, the USA Pavilion will transform guests from spectators to innovators, who will discover within themselves the source of “Infinite Energy” — the energy that fuels dreams and brings people together to do amazing things. The USA Pavilion experience celebrates this energy through the imagination, innovation, and ingenuity of the American people and our partners around the world. This spirit of friendship and collaborative enterprise is at the heart of the USA Pavilion and America’s partnership with Kazakhstan. As one of the first countries to establish diplomatic relations with Kazakhstan after its independence and the first to open an embassy in Kazakhstan 25 years ago, the United States is proud of the strategic partnership we have mutually established with Kazakhstan. Participation in Astana EXPO 2017 demonstrates the United States’ continued commitment to strengthening and broadening the ever-growing ties between our two countries. I welcome you to the official website of the USA Pavilion, where you can plan your visit, get involved with special events throughout Kazakhstan this summer, and stay informed of the happenings at Expo and the USA Pavilion team’s journey. I am confident that the USA Pavilion will be a huge success, and I look forward to experiencing with you the amazing friendships, partnerships, and collaborations that will result from the USA Pavilion at Astana Expo 2017. I hope to see you in Astana!